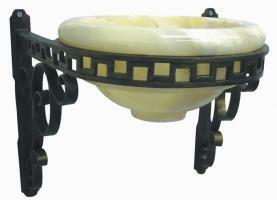 The simple and smart design of this wall mount sink will be a great addition to the bathroom. 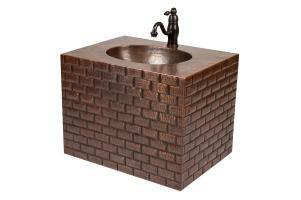 Handmade with recycled copper material this piece has fine details that enhance the great functionality. 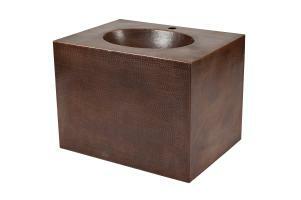 The cube shape is flat on every side, on the top the bowl is molded into an oval shape. 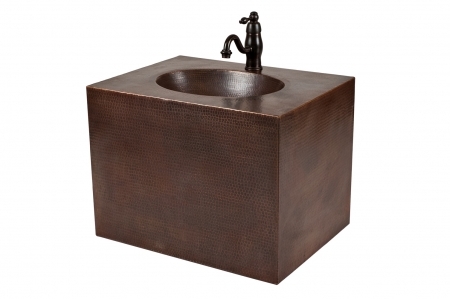 The wonderful metal material has a hand hammered texture that creates a beautiful pattern throughout the piece. 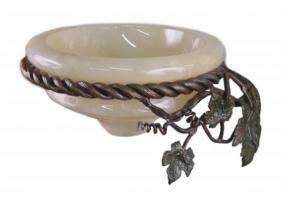 This design feature is enhanced by the oil rubbed bronze finish. The cube like shape is two feet wide, a little over two feet high and has a depth of 18 inches. This provides a great area for the countertop and sink. The faucet included with this sink has a traditional design that adds an old fashioned feel to the sleek lines of the piece. This will be a very nice addition to the bathroom.